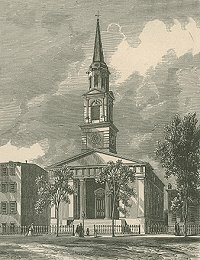 The South Baptist Church was organized on February 13, 1850 on Kinney Street by 37 members of the First Baptist Church. The First First Baptist Church erected the South Baptist Church building which opened on July 1, 1850. The church aided in local mission work through the Newark Baptist City Mission. A pipe organ was introduced to the church in 1859. "Rev. Dr. Hague will deliver two lectures on successive Sabbath evenings in the South Baptist Church, Kinney Street, on the Domestic Relations. The first on the 'Duties of Parents to their Children', will be delivered tomorrow evening at 7½ o'clock." Gives relief to members. Helps foreign, home, State, and local missionary work. Young People's Baptist Union, and organizations for young men and young women. Church open by appointment for religious work or meetings. Church Registers from about 1850 are in the possession of the Church Clerk.